Sen. Ted Cruz (R-Texas) isn’t backing down after calling so-called net neutrality “Obamacare for the internet” last week. On Monday, Cruz’s office fired off a series of new videos on social media sites — Vine and YouTube — where the potential 2016 presidential candidate decries any new government regulation of the internet. “Sen. 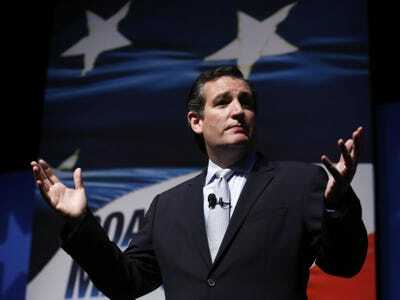 Cruz Joins Vine to Advocate Internet Freedom,” the press release declared. The video was recorded at an event Cruz did last week in Austin, Texas, where he further lambasted net neutrality, which argues in part that internet service providers should not be allowed to arbitrarily speed up or slow down their service. President Barack Obama recently endorsed the concept and advocated regulating these providers like utility companies, but Cruz said the idea was backwards and used a rotary phone to make his point. “This is regulated,” Cruz said in his second Vine video, pointing to the old-school device. He pulled out his smartphone. Additionally, Cruz’s office provided reporters with four other YouTube videos, including one responding to Sen. Al Franken (D-Minnesota), who criticised Cruz’s net neutrality stance on Sunday. All of Cruz’s latest Vine and YouTube videos are below.